As a child in the 70s and 80s in Singapore, I grew up with interesting food experiences. I think we always had excellent local street food. I grew up in Jalan Kayu, with the crispest and fluffiest Roti Pratas, and I still dream of the corner tze char stall which fired up a kind of dark soya sauce fried rice that seemed much more fragrant than regular fried rice. Jalan Kayu still has a notable food enclave but the old uncle who fried rice is long gone, and Jalan Kayu Roti Prata is not the same as before. As a family we usually ate home for most of the week, and Sunday evenings was pretty much the only time we would go out and have a nice meal. I always loved local food and I remember learning to eat spicy food when we went to eat nasi Padang at the Rendezvous restaurant. Tze Char and clay pot meals were usually from the Manhill and Hillman restaurants. Western food (our localized Hainanese version) consisted of dishes like Chicken Maryland and Hainanese Pork chops, which are carved on Singaporeans’ collective memories from that era. And although Singapore has always been pretty cosmopolitan from the get go, I’ve always been amused that even from early on we had Russian food in Troika and Shashlik restaurants. Which is why most people like me grew up in the heart of South-East Asia eating beef stroganoff and borscht, albeit a rather Chinese-fied version. I think local food is a definite go to in my family, and eating western type dishes is considered a treat rather than the norm. In some ways cooking Western style dishes is much easier than Asian dishs which need a truckload of spices and a much longer prep time. After all it is not difficult to sear a steak or roast a leg of lamb. Kid#1 and kid#2 are beef fans (not surprisingly because dear hubs loves his steak). Beef stroganoff is a wonderful one dish meal as it is usually awesome over egg noodles. Since I was cooking low carb however, I made some adjustments to the recipe to cut out the flour (xantham gum is a good thickener). 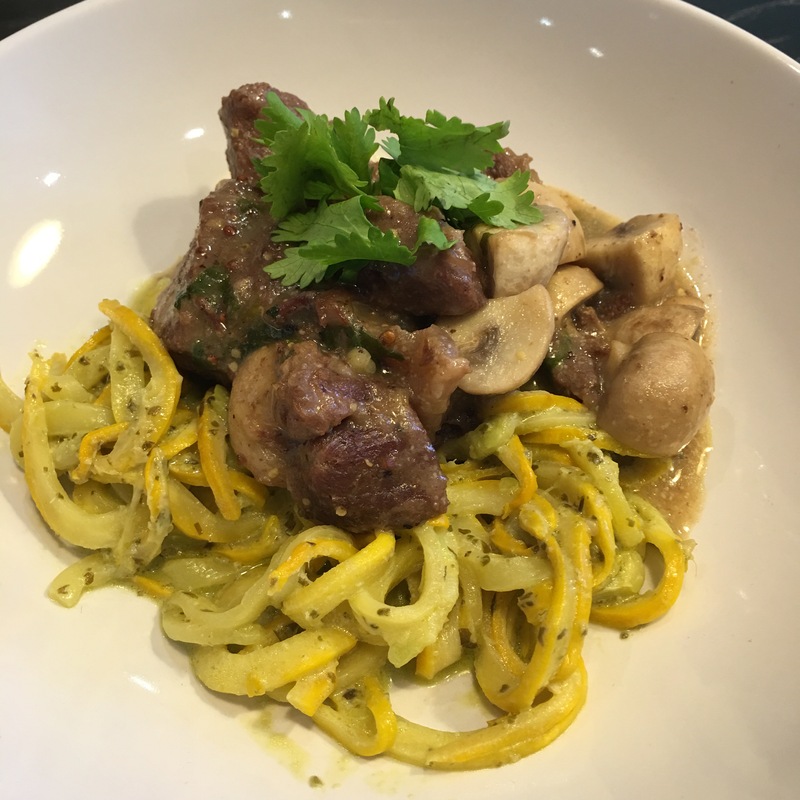 For the noodles, I used the spiralizer to get zucchini noodles “zoodles” which actually was rather nice and fresh tasting when paired with the creamy stew. My Instant Pot is still being broken in – I’m still in the process of working out a series of favorite meat dishes. As always I was wowed by the quick cooking, lovely and tender texture of the meat and the absolutely easy clean up after that. This low -carb beef stroganoff recipe is a keeper. Put the Instant Pot into Sauté mode. Heat up olive oil in the pot and brown the cubes of beef. Remove beef and set aside. Sauté the onions and garlic till caramelized. Add the beef back into the pot. Add the tomato paste, beef/chicken stock and bay leaf. Press the “cancel” button. Close the pot and put the valve on “sealed” position. Press the “meat” button which cooks the stroganoff for 35 minutes. When done, do normal pressure release. Press the “Sauté” button and add the bottom mushrooms to the pot. Add the sour cream and mustard and stir through. Sprinkle the xantham gum and stir gently, as the sauce will thicken up. Gently simmer for 5-10 minutes till mushrooms are softened. Put the stroganoff into a casserole dish and sprinkle the chopped parsley on top. Heat a skillet over medium heat and melt the butter. Sauté the minced garlic till fragrant. Add zucchini to the pan and stir fry. Add the salt and pepper to taste. Stir fry the zucchini till slightly wilted. Serve hot. Divide the zucchini into serving plates and ladle the stroganoff on top.